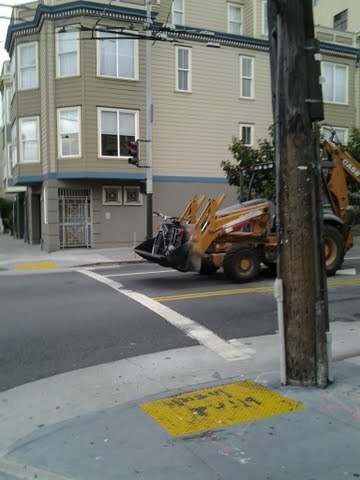 Did someone steal a motorbike with a construction Bobcat? I took this picture yesterday at 6pm on 25th and SouthVaness. Unfortunately my phone died just after I took this picture otherwise I would have called the police. This tractor was carrying away a motorized bike from mission then down s.vaness. It was being followed slowly by a sketchy grey older suv. There were three latino males in the van most were in their late thirtys to early forties. The tractor driver had on construction cloths and construction hat that almost made it look legit. The only other possibility I can surmise is that someone’s non-functioning motorbike was being transported to a mechanic by a buddy who happened to have some construction equipment at his disposal. Of course, that’s a bit of a stretch too, but is it crazier than someone making off with a motorcycle in a Bobcat? A backhoe loader rental would cost significantly more than a moped. So unless they picked up a couple more, this was a bust. hey bro, that’s not a bobcat. and by bobcat you probably mean skid-steer loader. like calling an open-end adjustable jaw wrench a crescent wrench. They guy who snapped that pic and sent it in with that (poorly spelled) description sure jumped to some pretty racist conclusions.